Katalin Mikecz, MD, PhD, received her medical and academic degrees from the Medical University of Debrecen, Hungary. After completing residency in the Department of Internal Medicine at the same institution, she was awarded a fellowship by Shriners of North America to work on an immunology-oriented research project in the Joint Diseases Laboratory of Shriners Hospital for Children, Montreal, Canada. Mikecz joined Rush in 1988. Since 2002, she has been a professor in the Departments of Orthopedic Surgery and Biochemistry. She is a member of the Biochemistry Graduate Program Committee at Rush. Mikecz’s research focuses on the immunological and genetic aspects of proteoglycan-induced arthritis, a mouse model of human rheumatoid arthritis. 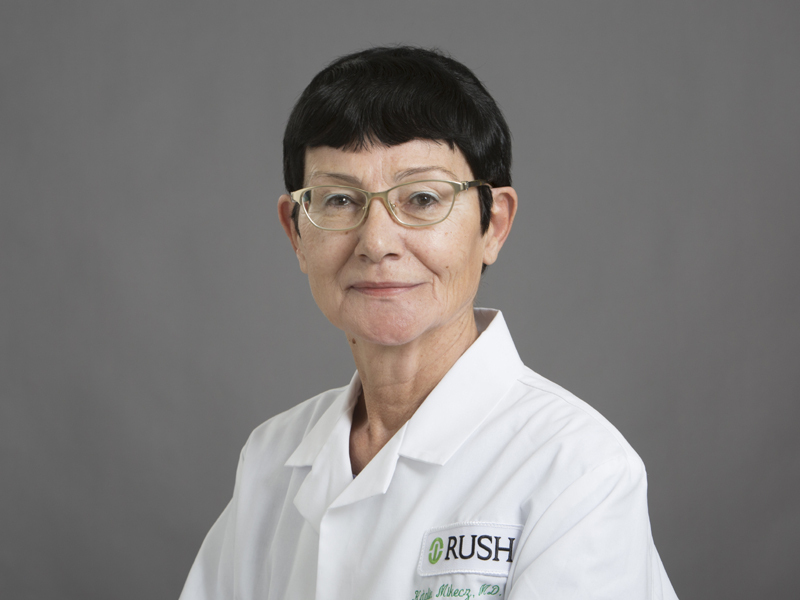 In 1995, she was a co-recipient of the Carol-Nachman Prize in Rheumatology, one of the most prestigious international prizes given to scientists for outstanding research in the field of rheumatology. Mikecz authored 132 peer-reviewed articles and several book chapters. Her research has been supported by the National Institutes of Health (NIH), the National Arthritis Foundation, and the Grainger Foundation. Mikecz is an expert in animal models of rheumatoid arthritis, autoimmunity, innate immunity, cell trafficking and in vivo imaging. She is a member of the American College of Rheumatology and has served as a member of numerous scientific review groups of the NIH since 2005.